I’ve always loved these little British bubble cars. 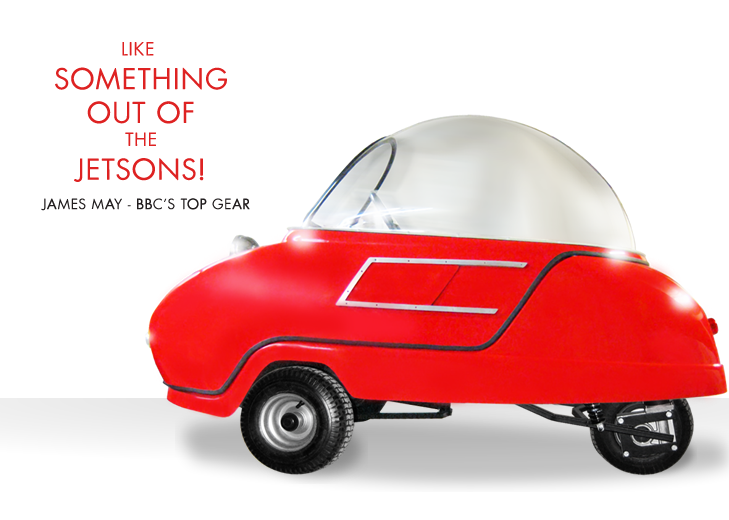 The 50cc Peel P50 (above), famously driven around the BBC offices at White City by Jeremy Clarkson (and John Humphrys) for Top Gear took the microcar concept to it’s logical conclusion, and gained a Guinness World Record for being the smallest car in the world. Well, you may have heard that the Peel is back. Available in an original 50cc moped engined version, and now a 1.5Kw electric version, it’s made appearances on Dragons Den and Cadbury’s Adverts. Since the apparent demise of the Messerschmitt-alike Smite concept, it’s the space age Trident that would be my microcar of choice. With it’s fifties flying saucer looks, it’s going to turn heads wherever you go. 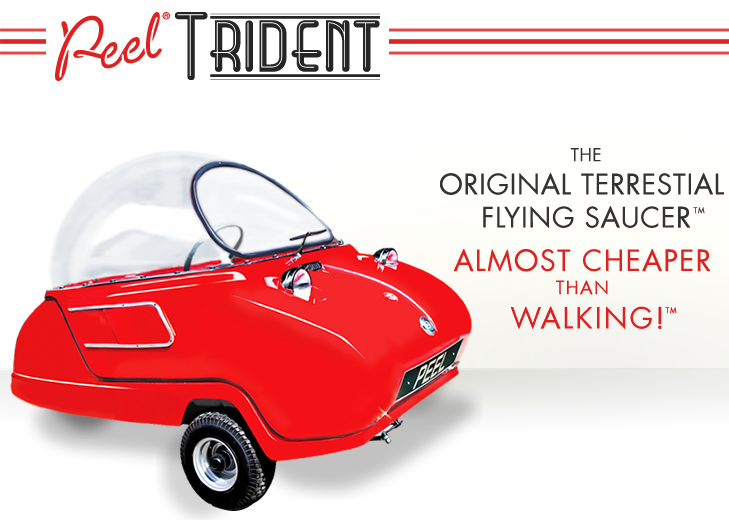 Originally designed as a shopping car, it was classed as a ‘saloon scooter’. The new electric version is fully road legal in the UK. The only fly in the ointment, and its a rather big, Jeff Goldblum sized fly, is it’s range… a measly 15 miles on a full charge. I’d expect it to make it to at least Saturn. Find out more on the Peel Engineering website. This entry was posted in Commercials / 3 Wheelers, Not a Lambretta and tagged British, Bubble car, Messerschmitt, Microcar, P50, Peel, Peel Engineering, Peel Trident, Smallest Car in the World, Smite, Trident by crocodilejock. Bookmark the permalink.